This article shows how to Archive an appointment location within TheraNest. Archiving a location will affect all entities (clients, appointments, etc.) related to the location. You will need to manually update any relevant details after archiving a location. Only TheraNest users with Administrative permissions will be able to archive or unarchive a location. 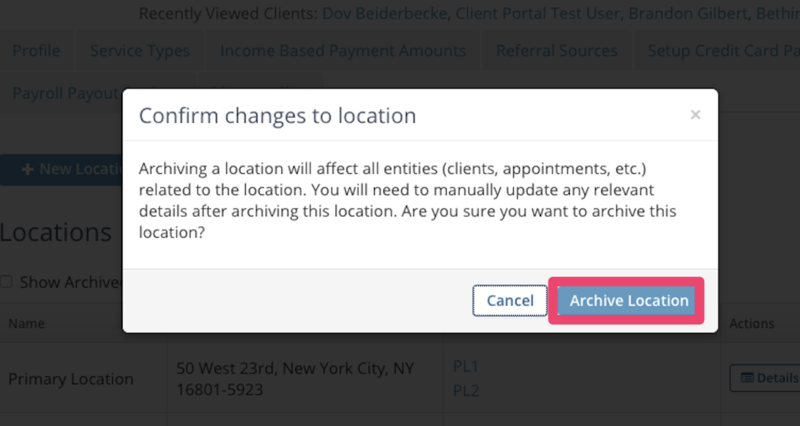 Find desired location and in the actions field click Archive. 3. You will receive a message asking you to confirm the changes. You must click Archive Location to confirm that you wish to archive the location. The now archived location will no longer be an option when scheduling appointments, but it will still show as a filter option for the calendar and agenda. Easily update all upcoming appointments associated with the archived location by using the Bulk Edit Appointments feature. Click here to see how to Bulk Edit Appointment Locations. Click here to see how to Unarchive a Location.